August 23, 2015 by The Junkie 0 comments on "For Learners: The Top 10 German Learning Strategies"
Let’s talk about German learning strategies. There is one great strategy that you’ll see here again and again. It’s reviewing. And it comes in many forms. So, today, you’re going to learn the top 10 German learning strategies (be sure to add your own in the comments so we can make this a top 20 list!). These will help you speak, read, and understand German better. 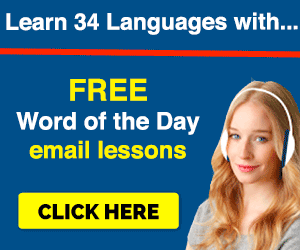 You’ll learn German learning strategies. You’ll learn how to read & say them in German (which means you learn even more German). Romanization, Translations. 1. Listen and read along to understand German better. Hör zu und lies mit um Deutsch besser zu verstehen. This my favorite German learning strategy. 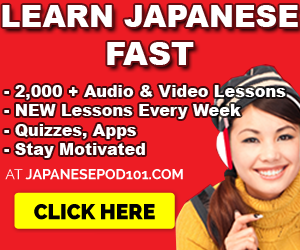 It’s one of the fastest ways to improve your reading, understanding and speaking skills. And boosting grammar and vocab. All at the same damn time. Here’s an example from my favorite German learning site – GermanPod101 – where you can listen and read along. 2. 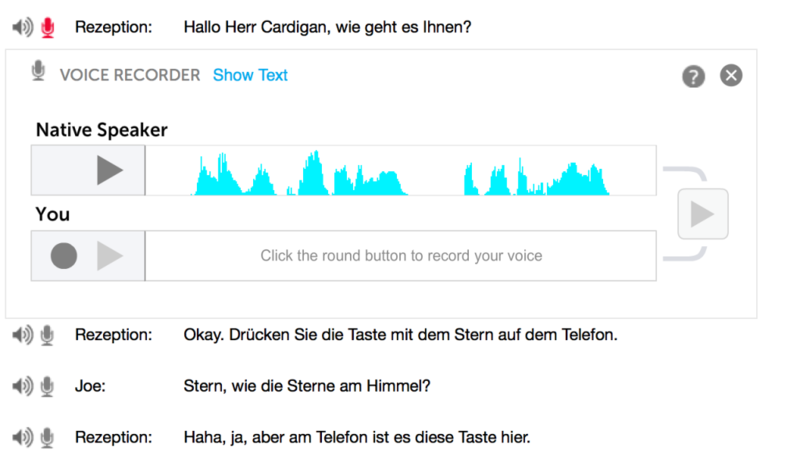 Record your voice and compare your pronunciation with native German speakers. Nimm deine Stimme auf und vergleiche deine Aussprache mit der von deutschen Muttersprachlern. Highly uncommon advice. However, if you record your German speaking… and compare it with a native speaker… you will INSTANTLY hear the difference. The result? You adjust yourself and you speak better German. Great for perfecting your German pronunciation. 3. Download dialog tracks and listen to the German conversations. Lade Dialoge herunter und höre dir die deutschen Unterhaltungen an. 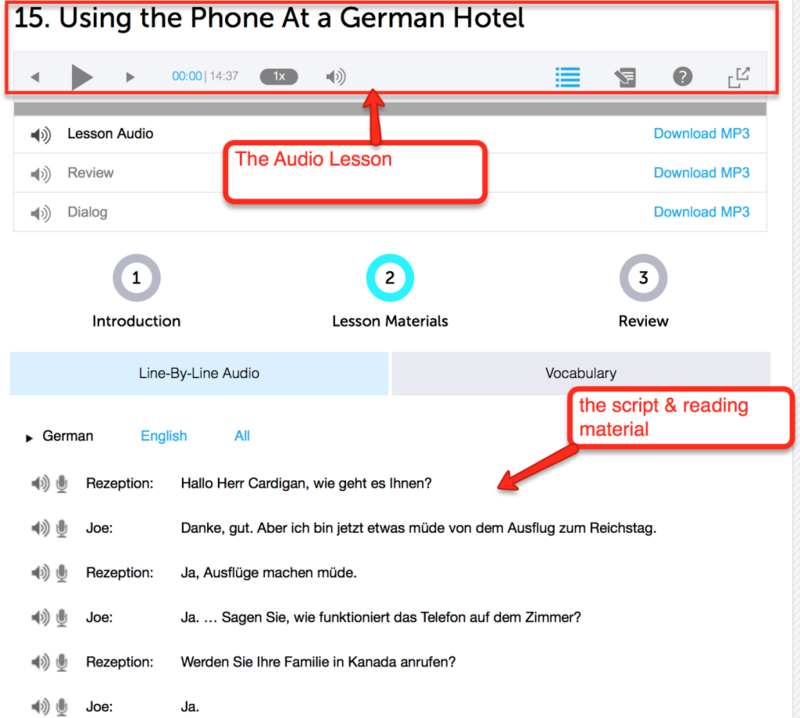 Now Imagine having a playlist of German conversations & lessons on your iPhone. Just German. No English. You can listen and re-listen and listen until real German conversations are stuck in your head. Wiederhole die Ausdrücke die du hörst immer und immer wieder laut. Why repeat? Well, in order to speak German…. you must open your mouth, push some air out of your throat, emit sounds and… SPEAK German. Wiederhole alte Lektionen um sie komplett zu meistern. The magic to fluency is in reviewing (again, repetition). Noone remembers things on their first try. Or second. But with enough reviews – you’ll be mastering German. Bleib motiviert indem du mit dem Dashboard deine Lernfortschritte mitverfolgst. How many German words do you know? How long can you speak German for… – 5 minutes, 10 minutes? You should know the answers to these questions. By tracking your progress and knowing how much you know… you become invested in the language. Imagine, what if you knew 500 German words and phrases. That’s a lot. That tells you that you can get to 520, 550, 600. And soon enough, 800. It goes on. If you sign up at GermanPod101, you can track your progress (lessons, hours, flashcards, % of series completed) with the Dashboard as shown above. Lies die Zeilen erst langsam, dann lies sie nochmal schneller. Then, I could read it with a single glance. At the same time, you familiarize yourself with more words and phrases. This makes future reading easier. Setze dir kleine und messbare Lernziele mit einer Deadline. When will you learn German? Set a deadline! Probiere schwierigere Lektionen um dich zu fordern und schnellere Fortschritte zu machen. Know how you can improve your German? Try lessons that are too hard for you. Yes, you will struggle. You will feel discomfort. Verbessere dein Hörverständnis indem du jede Zeile der Konversation mit dem Line-by-Line-Audio-Tool überprüfst. 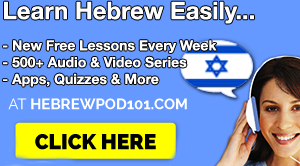 It’s an interesting tool (that really should be it’s own app & learning method) over at GermanPod101.com. Basically, it breaks down the entire German conversation … line by line.. so you can read each line – in German or with English translations. And you can listen to each line, again and again as you read. Very effective for understanding a German conversation 100%. What are your favorite German learning strategies? Let’s make a HUGE master list of strategies for new learners. P.S. I highly recommend this for German learners. 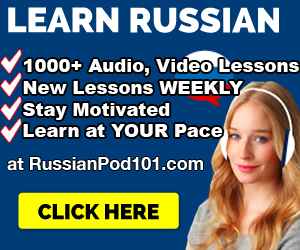 If you REALLY want to learn to German with effective lessons by real teachers – Sign up for free at GermanPod101 (click here) and start learning!